A fire of unknown origin has left a family of three homeless. The fire broke out at Lot 7 Marigold Street Samatta Point, Grove, shortly after 20:00 hours last night. Tiffany Lamazon, 17, and her two cousins, two and three years old are now unsure where they will spend the night. 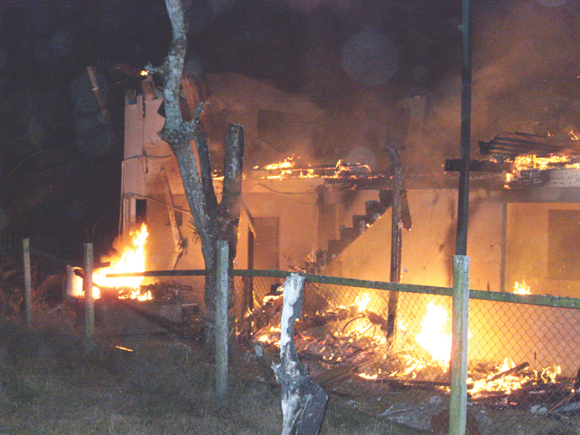 The burning building at Samatta Point, Grove. The home was quickly razed by the inferno. According to one neighbour, he was asleep when he heard shouts of fire. “I deh inside an hear the big lady next door hollering, “Fire! Fire! When I look outside I see the house bright inside”. The man said that the fire started in the front bedroom of the two-flat house and may have been electrical in nature. According to him the area was experiencing power fluctuations the day before. When Kaieteur News caught up with Lamazon, who was the caretaker for the property owned by her grandfather who resides overseas; she said that she received the dreadful news from her neighbours. Neighbours, who rushed to help, were unable to save anything from the property and according to the teenager although she cannot give a specific cost of the damage it has to be in the millions of dollars. The young lady said she is sure she did not leave any electrical appliance on when she left. She is at a loss about what may have caused the inferno. The house was unoccupied at the time. The two children were at the baby sitter as is customary when Lamazon leaves for work. The teenager said that she is not sure how to break the news to her grandfather. The structure has been there for the pass 18 years. Fire tenders were at the scene but they reached long after the fire was raging. The fire-fighters did a lot to save the neighbouring buildings.